Paul McCartney had so many wonderful moments in his time with the Beatles, some big, some small, but all beautiful. I have an ultra rare clip of the man playing “Blackbird,” his gorgeous ballad from the White Album. This is footage of Paul playing the song for Beatles producer George Martin in the Abbey Road studios in 1968. Paul wrote the song in Scotland thinking on the subject of civil rights, and the song is meant as a tribute to black women everywhere (bird being British slang for girl.) The intricate acoustic backing was inspired by J.S. Bach’s “Bourree in E minor,” a piece meant for lute and classical guitar. 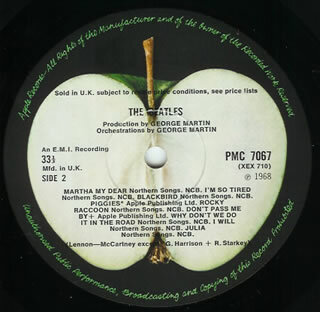 Paul took the songs main element, the simultaneous plucking of the bass and top strings, then shifted and rearranged the piece in the key of G. “Blackbird” is one of Paul’s most heartfelt and genuine songs, so much so that he took it upon himself to play it for the Apple Scruffs, (die hard Beatle fans,) on his front lawn the first night Linda McCartney slept over his house, obviously overcome with joy. The video below is a little grainy, but a remarkable document of Paul in one of his most fertile songwriting phases. Also, gotta love those red and yellow psychedelic shoes he used to tap out the rhythm.